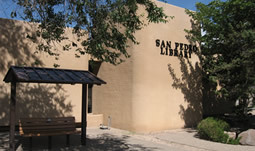 The San Pedro Library is located in a residential area on the SW corner of San Pedro Drive and Trumbull SE. Route #34: San Pedro Commuter, operates only during peak hours. Plan your trip here. Take I-25 to the Gibson Blvd exit. Go eastbound on Gibson about three miles to San Pedro. Turn north on San Pedro past Kathryn to Trumbull. Central Avenue to San Pedro. Turn south on San Pedro past Zuni. Trumbull is two blocks south of Zuni. San Pedro Library does not have any meeting or study rooms. Please see our list of Meeting & Study Rooms at other Public Library branches. Join in the fun with stories, songs, puppets and more that encourage development of early literacy skills in young children, using the guidelines from the Every Child Ready to Read program. Weekly Preschool Storytime targeted for ages 3 - 5. If you love to build with friends, come join our Lego Club. Meets twice a month. Legos provided! No registration required. Sit back, relax and listen to a San Pedro Library staff member read aloud from a selection of classic literature, short stories or other favorite works. Unlike a book club, there is no need for you to read the selection ahead of time, but feel free to join in a lively discussion after the reading. Get one-on-one help with using the Internet, email or Microsoft Word; downloading eBooks, magazines, music & working with tablets or smartphones.Computer assistance in Spanish available. A library card with computer access is required. Registration required, call to register (505-256-2067). Join us for a relaxing time with good conversation. Unwind by working on a puzzle with like-minded people. A wide variety of jigsaws to choose from. Drop in for a bit or stay and see how much you can finish. All ages welcome! We have puzzles to check out! Stop by the library and see our selection. 4th Wednesday of the month, 5:30-6:30 p.m.
Have you always wanted to do creative writing but have been afraid? Do you want to write stories with more imagination? Do you want to be a great storyteller? Join our creative writing group and be inspired! Each month we’ll do some writing and learn about things that make a good story. To register click here, call us at 505-256-2067 or stop by the front desk.All levels welcome! 2nd Saturday of the month, 2:00 p.m.
Do you like movies? Do you like to talk about movies? Join our movie discussion group. Call 505-256-2067 for this month's movie.